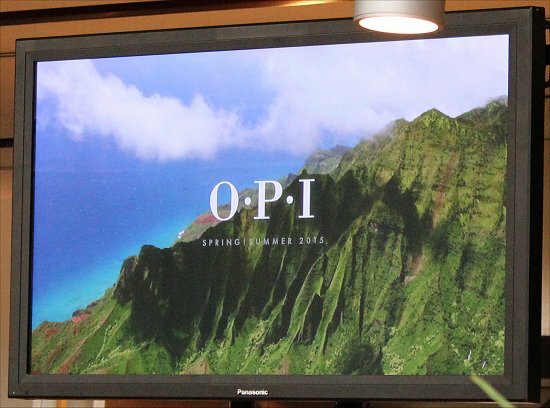 Paying homage to the only U.S. state comprised entirely of islands, the OPI Hawaii Collection for Spring/Summer 2015 is set to hit stores on February 4. 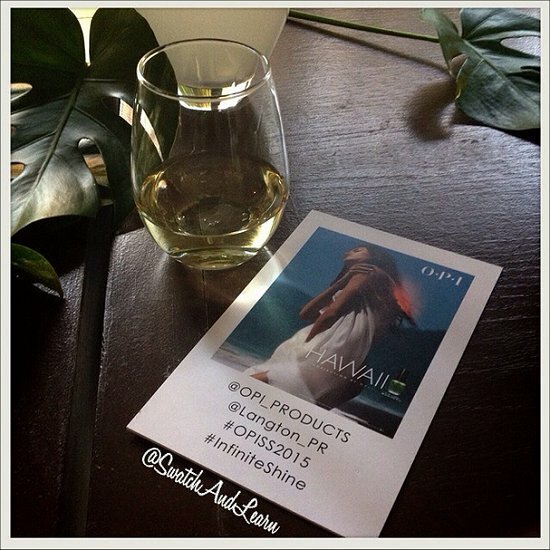 I’ve never been to Hawaii, but after attending the OPI Hawaii Collection Media Launch on October 31, 2014, I got a taste of it, and let me tell you, it’s every bit the dreamy oasis that you can imagine! Aside from Egypt and anywhere in Spain, Hawaii is one of the places that I hope to visit because of the tropical climate and scenic views. It seems like such a romantic destination that is full of soul. 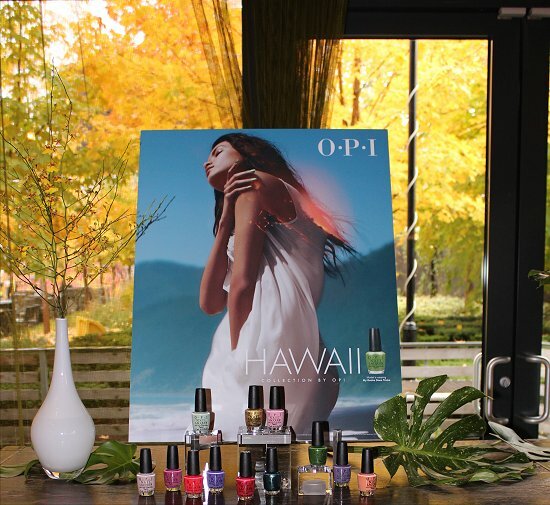 During the OPI Hawaii Collection media launch, I was honoured to preview all 12 shades in the collection and be, once again, in the presence of the First Lady of Nails, Suzi Weiss-Fischmann, who is the Co-Founder, Artistic Director, Executive VP, and Brand Ambassador of OPI. 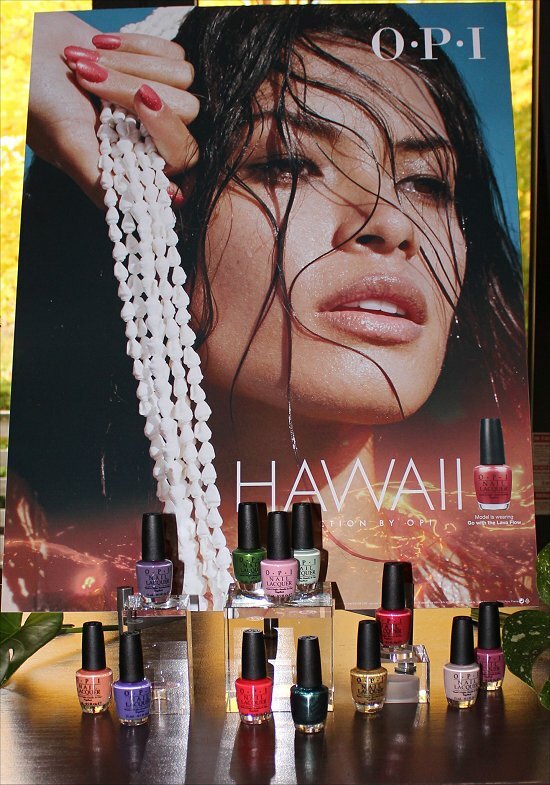 Also, if you are mainly interested in seeing OPI Hawaii Collection swatches, bottle shots, and the official press release, click that link to see the post I published shortly after the media launch. 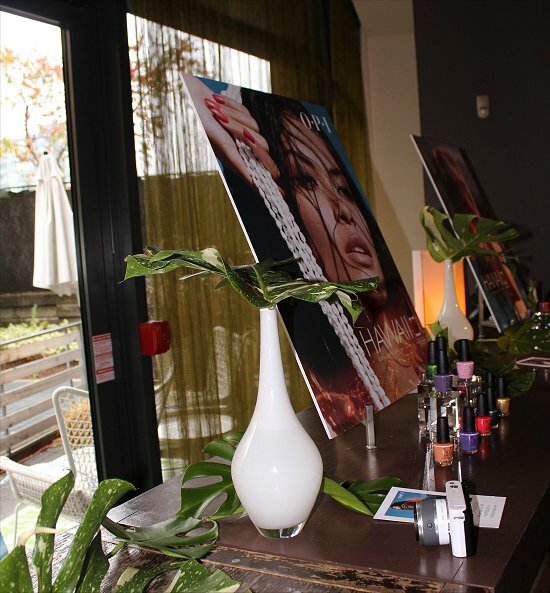 Although this post focuses on the OPI Hawaii Collection, I will also show you lots of photos I took throughout the event of the gorgeous displays, the long stretch-limo-esque seating area, Suzi Weiss-Fischmann, as well as share my commentary on everything from the venue to the food. It was a novel experience for me. I’m not usually invited to attend such grand events on a regular basis, so when I get to go, I soak everything up like a sea sponge nudged closer to a pool of water. In essence, I want this post to make you feel like you were there with me and see everything that I did. I want to extend a huge thank you to Langton Communications, the PR firm that formerly represented OPI in Canada and currently represents many other beauty, health, and lifestyle brands that are household names! Their tight-knit, dedicated team is hard-working, and they were among the first major PR firms that I began collaborating with about a year after I started my blog. 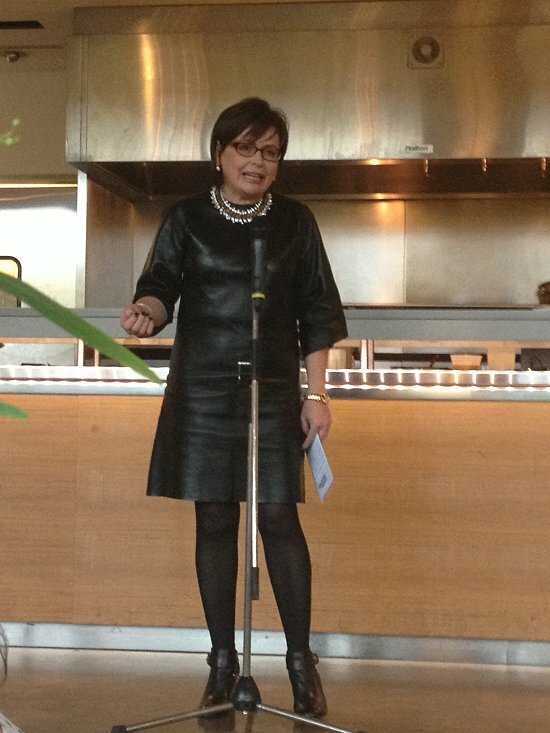 Collaborating with all the smart women at the PR firm has not only been a pleasure, but also really exciting! 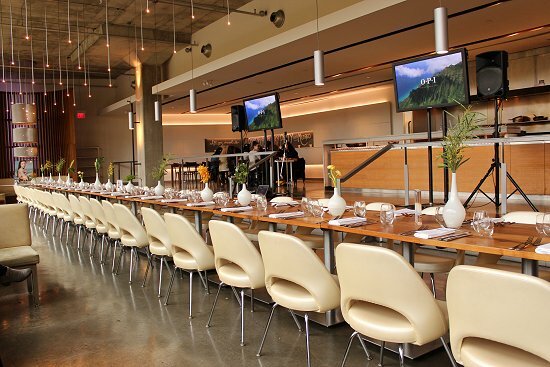 Additionally, I would like to put the spotlight on the incredible staff at Mildred’s Temple Kitchen, where the event was held. 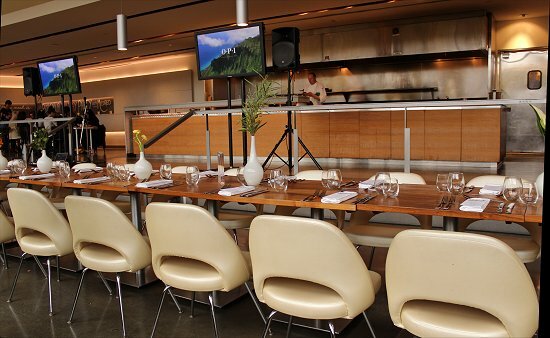 Mildred’s Temple Kitchen is located in Toronto at 85 Hanna Avenue. 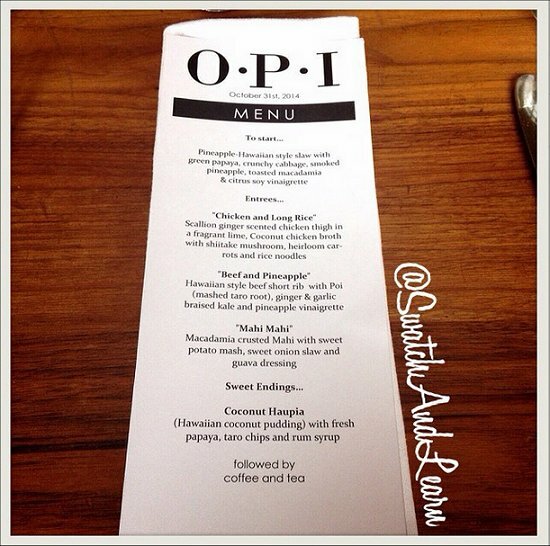 The entire restaurant was closed to the public, so that the staff could cater to the needs of the private OPI Hawaii Collection media launch! (Very VIP!) 🙂 The service was impeccable! I took Friday October 31st off work, so that I could attend the event, which commenced at 11:00 am. It was a rainy morning, and the sky was overcast, but my heart was full of sunshine because I was very much looking forward to the experience ahead of me! When it was closer to ‘show time’, I made my way to Mildred’s Temple Kitchen. 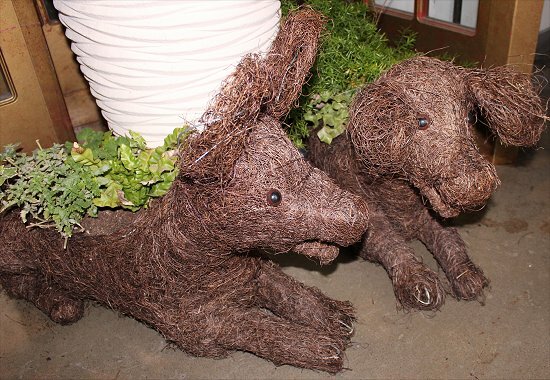 When I first arrived, I immediately noticed that these little guys greeted me. Well, hello there! 😉 I couldn’t resist snapping a photo of them. 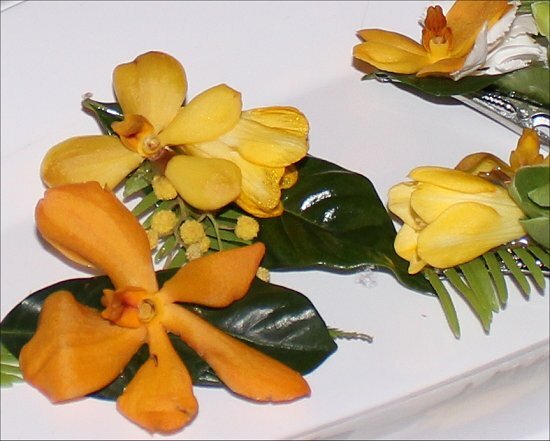 On two elegant, white, oval plates were pretty flowers. Each was attached to a clip, so you could wear it on your hair! As you can see, they dived right into the Hawaiian theme upon entrance. Nice! Here’s a closer look at some of the flowers. By the way, the flowers were real, not plastic! I thought that was a fun touch! Walking past that, I couldn’t help but notice the cool lighting fixtures! Little fact about me: I tend to check out ceilings a lot wherever I go. Some of the most beautiful artistry can be found when you look up. And even when I’m outdoors, I tend to look up and try to find pictures in the clouds (as you may remember from this old post). On the right side when I walked into the restaurant was this lovely scene. 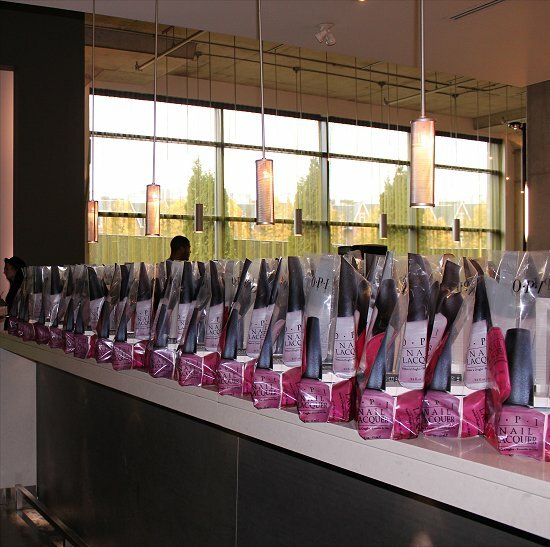 Look at all those gorgeous OPI swag bags! Along the back, you’ll see that there’s an artistic background. 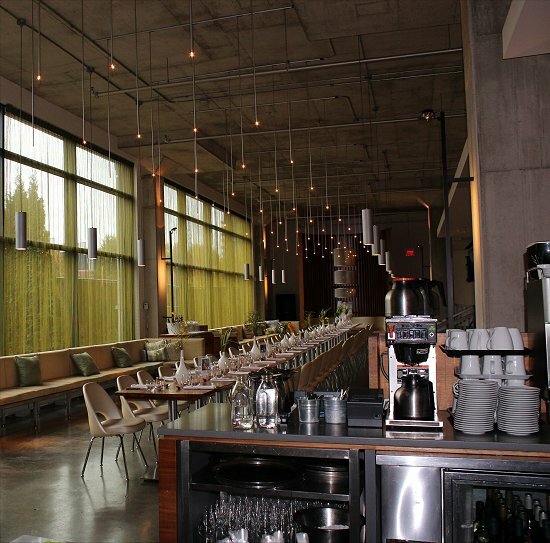 There are long, wave-like strips in frosted and shiny glass-like sculptures, held together with steel poles. 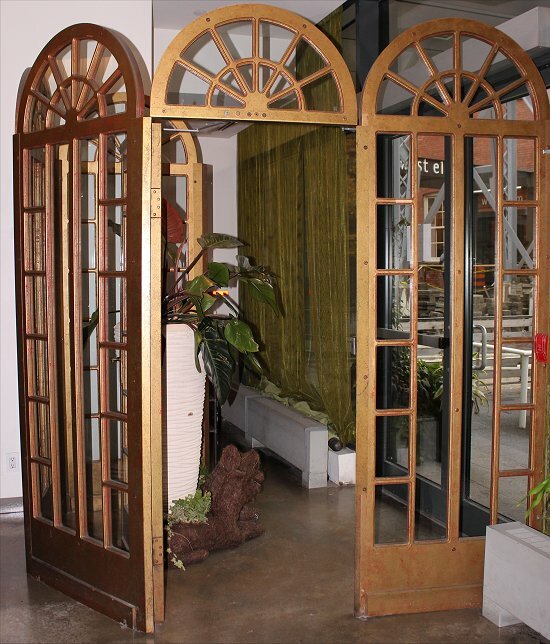 This gave the space an elegant, artistic appearance. 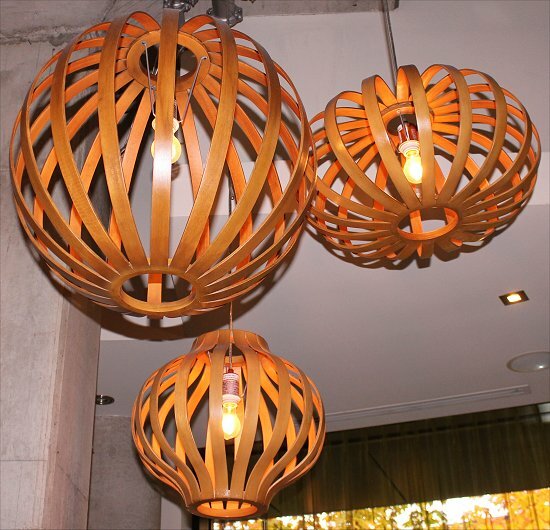 I also liked the pendant lighting with a sophisticated and minimalist design. 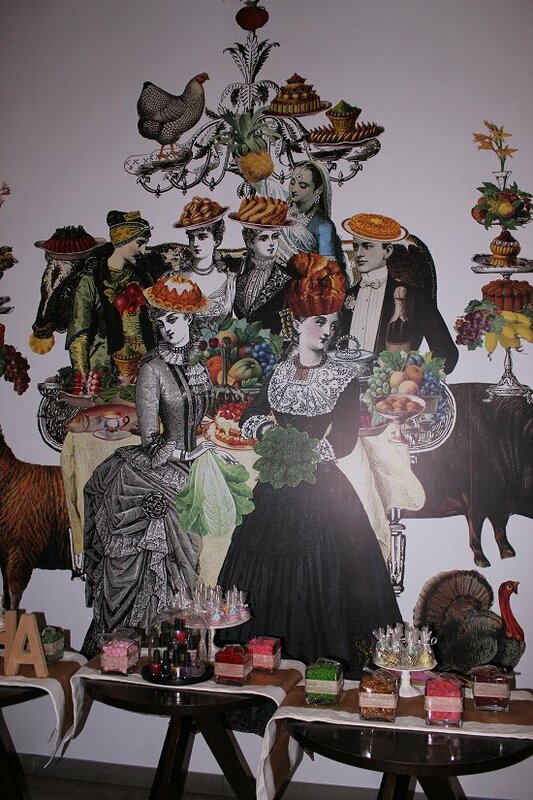 I nearly gasped when I caught a glimpse of the lunch setting! It’s so elegant and bright. Plus look at those little lights – I imagined that they were little stars in the sky! Also, on the left, there was a long line of lounge sofas, so before the lunch, we could chit chat and relax. Up the stairs, which you’ll see on the right in the photos below, there was a manicure station where we could have our nails done. This time, I opted not to schedule a manicure appointment because I always end up denting my nails and ruining their hard work when I’m at these events. This is because I’m constantly reaching for my camera or my smartphone, and when I eat, I’m all about the food and completely forget about just-done nails. Look at the photo below. See the chef in the background? That’s Chef Michael Leary, the talented Chef de Cuisine at Mildred’s Temple Kitchen! With every dish that came out, I could see (and taste) Chef Michael Leary’s exquisite attention to detail. Each one was an edible work of art. 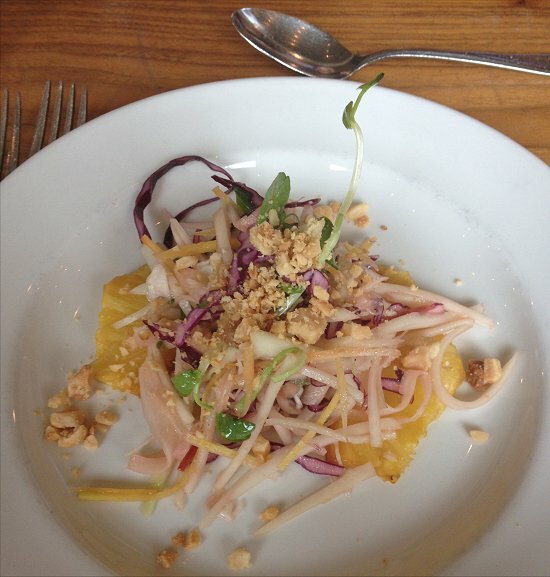 The appetizer was pineapple-Hawaiian style slaw with green papaya, crunchy cabbage, smoked pineapple, toasted macadamia, and citrus soy vinaigrette! While it took Chef Michael Leary lots of thought, preparation, and time to come up with this, I gobbled it up piggy-style in under a minute. And I enjoyed every bit of it! *Oink Oink* Eat your heart out, Wilbur! The smoked pineapple with macadamia and citrus soy vinaigrette was a combination I’ve never tried before, so my palate was soaring through taste-bud heaven! We got three options for the entree, and I chose Beef and Pineapple. It was Hawaiian-style beef short rib with Poi (mashed taro root), ginger and garlic braised kale, and pineapple vinaigrette. So delicious! 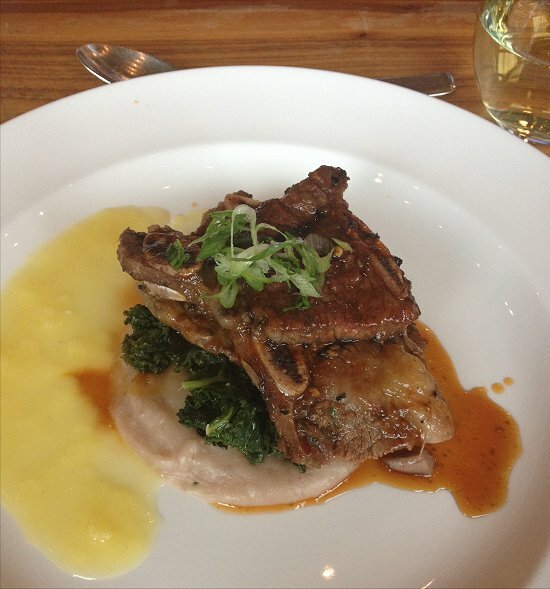 And you know me, I’m crazy about kale, so when I saw it on the menu, I was thrilled! To close, the dessert was the decadent Coconut Haupia (Hawaiian coconut pudding) with fresh papaya, taro chips, and rum syrup. This was sweet and satisfying! 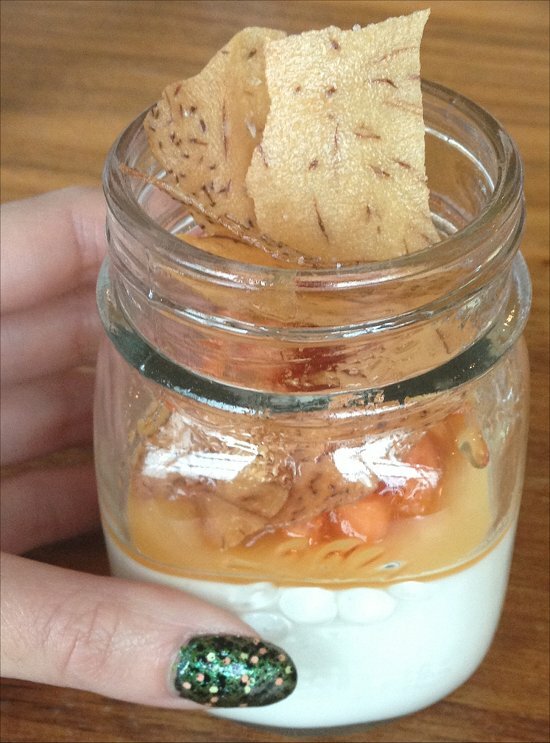 Plus how cute is it that the dessert was served in small mason jars? That was a little glimpse at my manicure. I dedicated an entire post to my Hallowe’en 2014 manicure with lots of photos. Click on the link or the below image, if you wish to see it. Before we dived into delicious food, though, we got an inspiring and colourful presentation on the TVs showing flashes of Hawaiian scenes. It was accompanied with the appropriate music, and it was like going on a mini vacation! 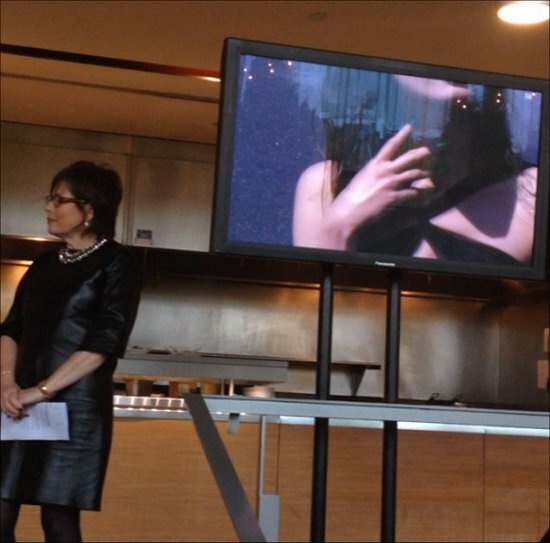 I recorded short Instagram videos when Suzi Weiss-Fischmann was talking about the collection and nail trends. We were able to sit anywhere we wanted at the table, so I chose near the middle. Across me were Donna-Lee Langton (the founder of Langton Communications) and Suzi Weiss-Fischmann! On my right sat Chrissie Rejman (the Senior Producer of Cityline and CityTV), and on my left was Lindsay (Nail That Accent blogger). To the left of her was Marta (Chit Chat Nails blogger). Now onto the actual nail polishes! Sometimes I feel like the little touches can get lost in the grand scheme of things, so I made sure to do a close-up of the flowers elegantly displayed in the vase. Delicate and beautiful! In fact, while snapping photos of the above OPI nail polishes and posters, I had to stop and snap a photo of what it looked like outside. 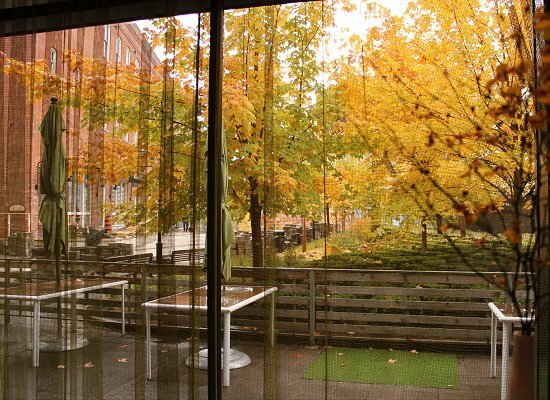 The windows framed Mother Nature beautifully! Of course I fell in love with the two greens, but OPI Pineapples Have Peelings Too! caught my attention as well because it was so unusual. It’s gold with colourful glitter. At first glance, I thought it was like OPI Polka.com and a pineapple had a love child. On a wall just outside the seating area was this funny scene! 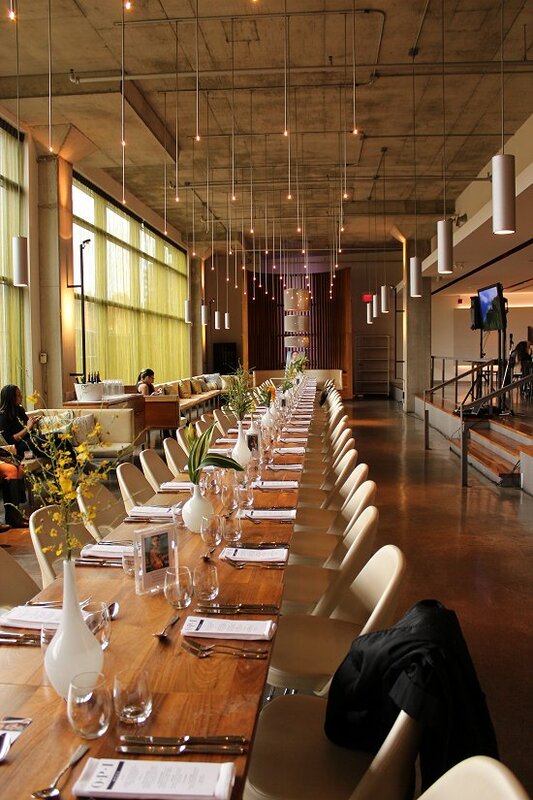 In front of the wall were tables beautifully and carefully decorated by Stephanie Beaudoin and Vanessa Ponti. It was cute how it looked like those quaint candy shops. 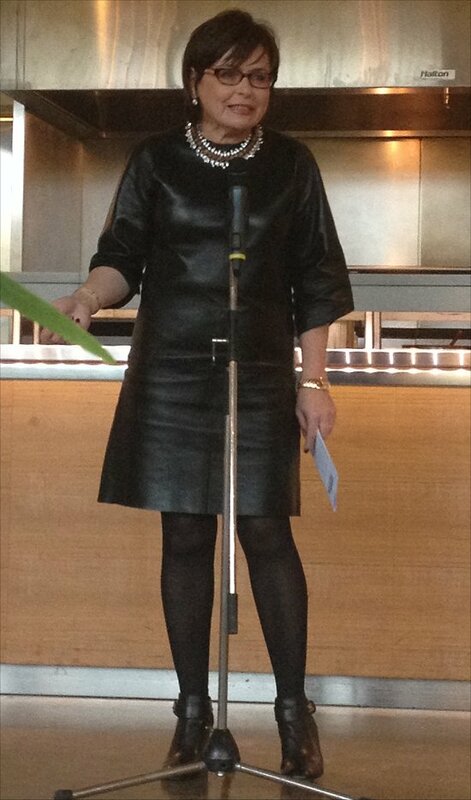 And hey, this event was held on Hallowe’en, so it was a fun touch! Each container was filled with candies, and there was a scooper on top. 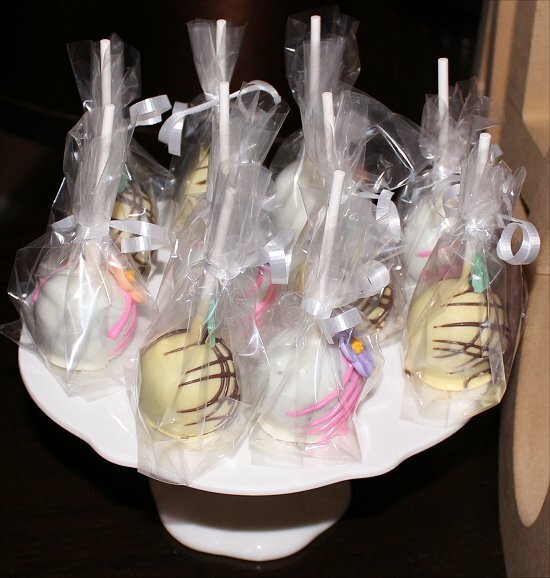 In the back, there was a cake stand with creative cake pops. The blue ones below were my favourite! 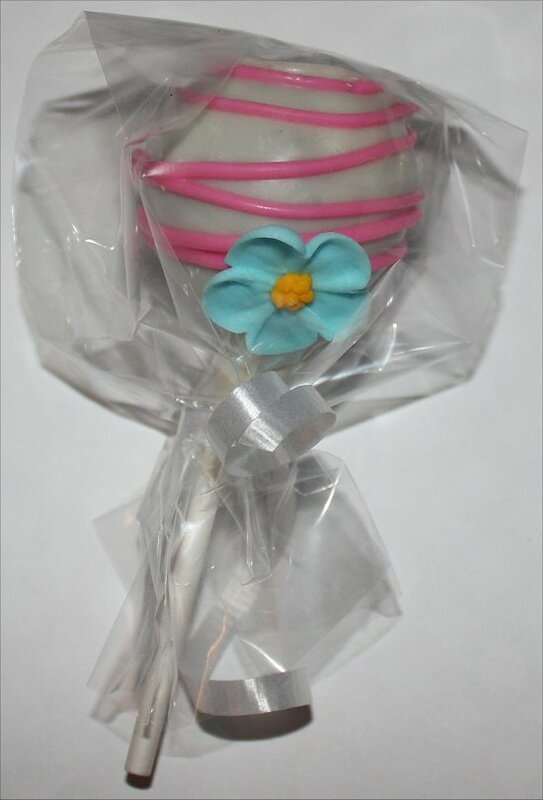 How pretty are these cake pops? Here’s the candy bag I filled. They had different colours, but of course I chose the green one. 😉 And I only took a few candies, as you can see. 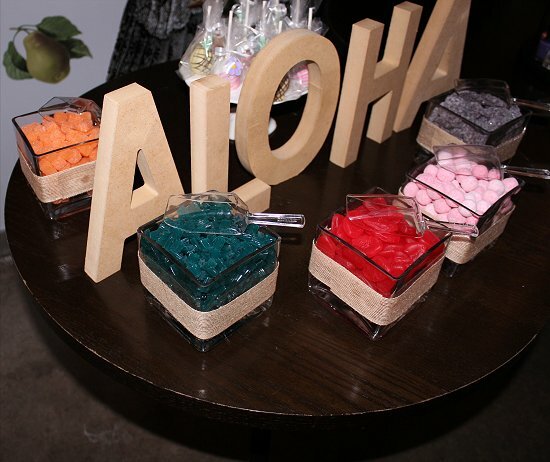 The OPI Hawaii Collection was housed under a glass dome, so it looked like candy-shop sweets! Cute, right? 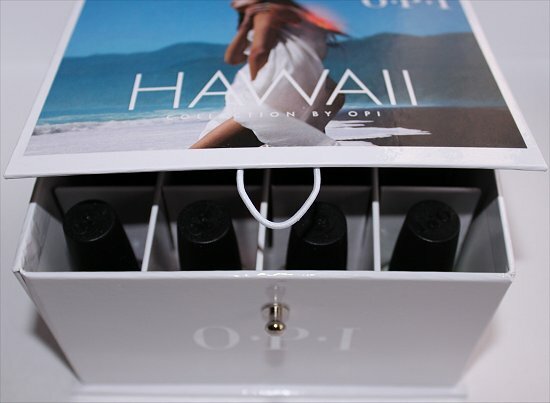 The OPI swag bags they gave each person upon leaving included the press release and a collectible box containing all 12 shades in the OPI Hawaii Collection! 🙂 Obviously, I treasure this exclusive gift! They also included an OPI Infinite Shine gift plus swatch card. 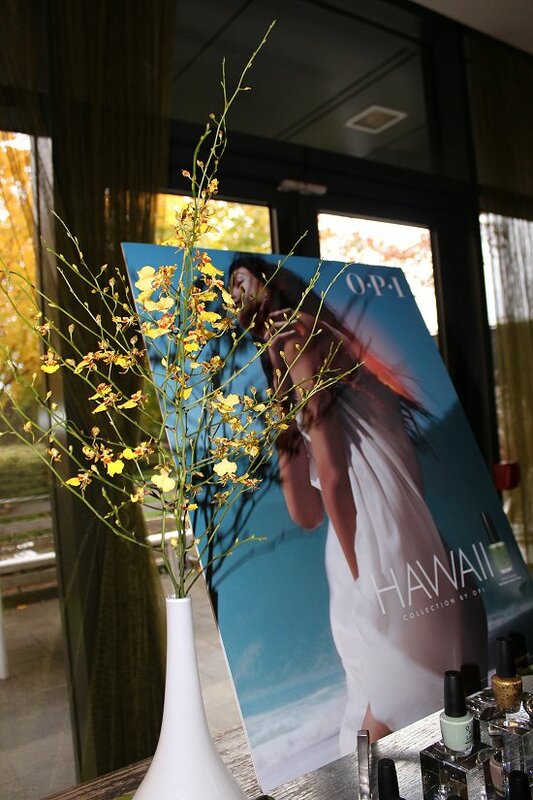 I had a wonderful time, and it was a complete honour to be invited to experience the OPI Hawaii Collection media launch. Thank you to everyone who worked behind the scenes and in front. You all put together a fantastic and memorable event! My dear readers, I hope that you enjoyed this blog post! I have a lot of fun preparing these types of posts because it’s like I’m bringing you along in my pocket, and we’re sharing the experience together in a way. Have you ever been to Hawaii? If you could add an extra colour to this collection, what would it look like? What’s your favourite shade from this collection? 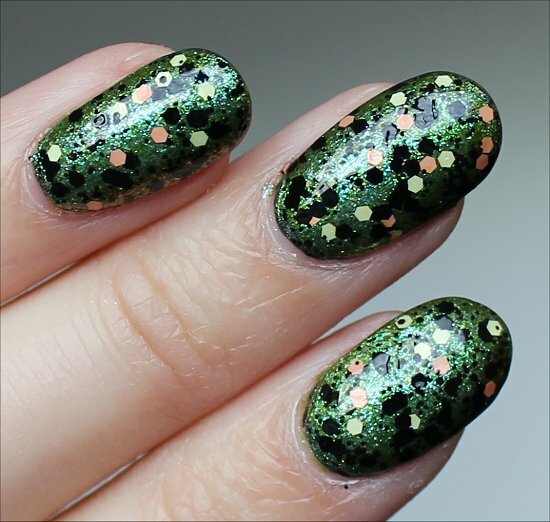 I posted swatches of the Green Dotticure I did using the two greens from this collection: OPI That’s Hula-rious! and OPI My Gecko Does Tricks, which you can see by clicking on the link. 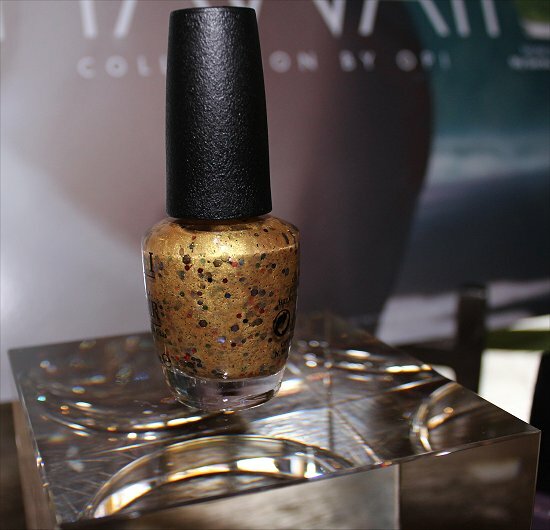 This entry was posted in Blog News, Nail Polish Swatches & Reviews and tagged Langton Communications, OPI on January 2, 2015 by Mary S..
Beautiful! Another great write up. Hey the place looks just like a Hawaiian restaurant. I lived in Hawaii for 3 years. Lovely place. That collectible box is so cool also. Thank you for sharing. Wow, living in Hawaii must’ve been incredible! What a romantic place. Bet you have lots of gorgeous photos with scenic views! I would definitely add a yellow! Also on Maui there is a plant called a silver sword that is very fragile and only grows on the crater there, so a silver could have been fun! Good idea! I’m all for the yellow, especially one that’s very pigmented and that doesn’t stain! The Silver Sword sounds really cool – good idea for the inspiration behind a new polish colour! I love these posts- it really feels as though we are tagging along with you. Wow that gorgeous box should have a special spot on your vanity. so pretty to look at and handle, I am sure. I have in laws in Hawaii so I have been there a few times. the thing I was first struck with on my visits to the Big Island is the lava rock and black sand everywhere. it is that rich volcanic soil that feeds the fertility of the land there. 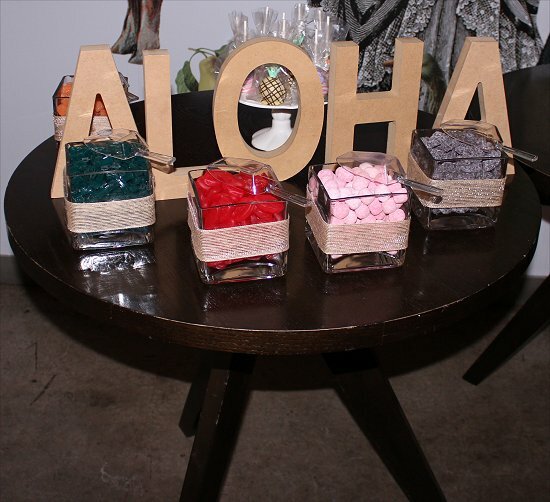 I would have added a Black Liquid Sand polish with colorful sparkle to it, just like the beaches(there are also green sand and white sand beaches there- but the black sands are more plentiful). I am thinking the black version of Alcatraz Rocks, if you get my drift. 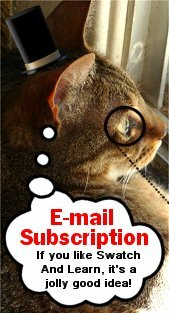 thanks again for a wonderful post! Totally agree, I made it a mission to find a black sand beach before leaving Hawaii for home. OPI Alcatraz Rocks is one of my favourite Liquid Sands. Your idea for a black version of it is really appealing to me. They should make it! 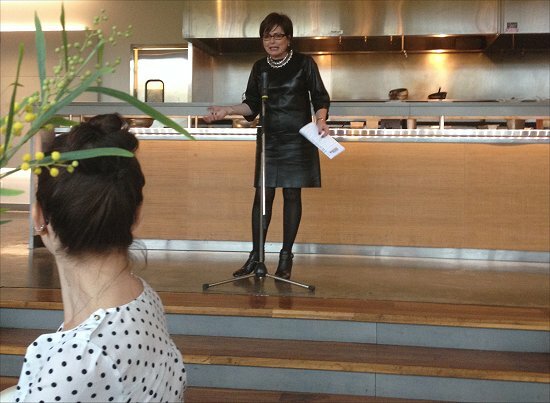 Oh yes – the food was a huge highlight from the event, and I really enjoyed all the hard work and dedication of the Langton Communications staff to organize the whole thing! It was really impressive! What a great opportunity and a awesome lunch! It looks/sounds like you had a great time. Thanks for showing the new collection to us. Such bright colors, perfect for spring/summer. I’m really fortunate to be able to attend these events every now and then. It’s really the biggest treat for a nailphile! 🙂 And I love sharing the experience with wonderful readers like you! love this collection, especially nrs 5, 7, 8, 9 and 10. Don’t like the greens, but that’s because green is horrible for my skin tone. Aww, as a green fiend, it pains me that greens don’t play well with your skin tone. Maybe you just need to find one with a suitable undertone that’s more flattering! Those food pictures made me so hungry. Especially that coconut pudding in the mason jar–yum! If I could add a color, I think I would want to add a rich yellow creme, like the color found in a beautiful tropical sunset. You should’ve seen me at the event. I was completely focused on the food when eating. It was edible art, that’s for sure! Oh, I would love to see them do a beautiful yellow. It’s one of the nail shades that I feel there aren’t made enough, yet the colour is so fun to wear! Such a great collection! I love it. I am so excited for this collection. I love the photos and the recap of the event. I feel like I was almost there. Thanks for doing this and not just saying, “I met Suzi” and going on with the polish reviews and pics. You are the luckiest girl to not only meet Suzi once, but numerous times now. 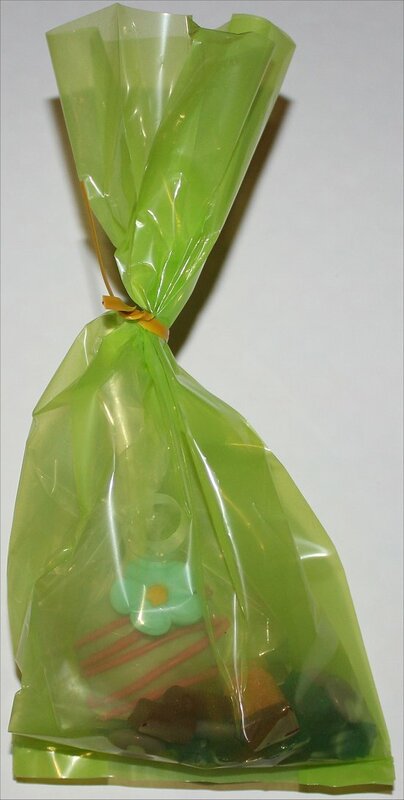 And those goodie bags!!! Thanks for checking this out! 🙂 I know this post was long overdue – my schedule has been crazy busy (as usual), so it makes me feel great that you were patient and enjoyed this post! 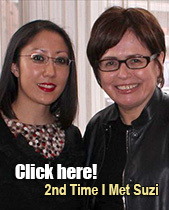 Hehe, yes, I feel extremely fortunate to have been in the presence of Suzi so many times! It’s a nailphile’s dream come true!